Fennell and St Vincent’s take on Ulster champions Ballinderry in the AIB All-Ireland Club SFC semi-finals tomorrow. 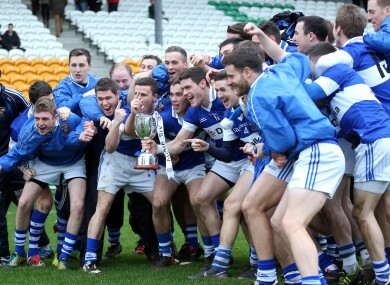 Vincent's celebrate their Leinster SFC title - but will they be smiling against Ballinderry tomorrow? THEY HAVE BEEN through a lot together this season — but what are the St Vincent’s lads really like? The Marino club take on Ulster champions Ballinderry in the AIB All-Ireland Club SFC semi-finals tomorrow. We grabbed a quick word with midfielder Éamon Fennell and asked him for the lowdown on his team-mates. 4. Biggest messer in the dressing-room? 10. Biggest leader and motivator? Email “Éamon Fennell dishes the dirt on his St Vincent’s teammates”. Feedback on “Éamon Fennell dishes the dirt on his St Vincent’s teammates”.